Create this delicate seed bead bracelet using Preciosa flat square shapes and a shining magnetic clasp. Cut an armspan of thread and thread 7 seed beads to the centre of the thread. Bring the two sides of thread together and thread a needle onto each. Thread each side of the cord through each of the two holes on one of your square beads. Thread 2 seed beads onto each of the threads. Pass both threads through a single seed bead. Thread another 2 seed beads onto each of the threads. Add another square bead onto the threads. Repeat this until your bracelet is the length you require. Remember to allow for your clasp and jumprings which will measure an extra 2cm. 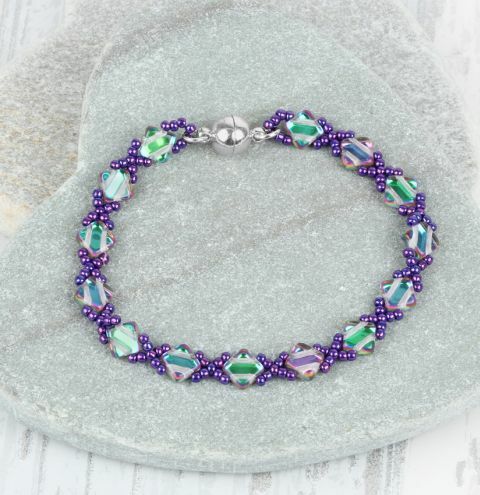 At the end of your bracelet, finish by threading 7 seed beads onto one thread and knotting the two strands of thread together. Pass your threads through the beads nearby and continue to weave the tail threads into your design to hide them and add some extra security. Cut off your threads once you are happy you have hidden them and secured them in place. Attach a jumpring onto each end of the bracelet into the loop of 7 seed beads. Attach your magnetic clasp to these jumprings.